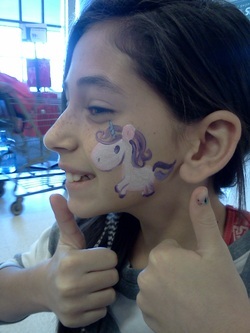 Face painting makes a great, fun addition to any child's party, fundraising events, school events, and more!! Art teacher by day, face painter on the weekends, I have years of experience working with people of all ages. I'm skilled in both "boy" and "girl" designs and can do either cheek designs, "eye masks", or whole face designs. From simple hearts or stars, to in depth monsters and even Van Gogh for your more upscale, adult fundraisers! I use non-toxic, professional quality paints only that wash off easily with mild soap and water. Average 20 children per hour for cheek designs and 10 per hour for whole face designs. Can travel in the Boston and North of Boston areas.